We're not experts, and we're not paid professionals. We're just regular enthusiasts who take time out of our regular lives to get together and test these products. Why? Because we can. And when it comes to testing radar detectors and laser jammers, we take things very seriously. This event was sponsored by RadarBusters. 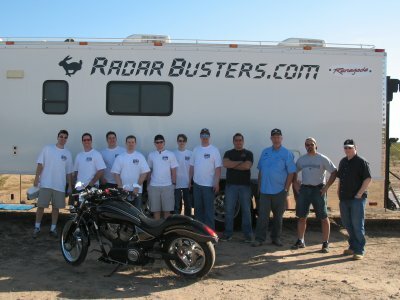 Big thanks go out to Radar Roy of http://www.radarbusters.com for making this event possible, and for all the help and support. Roy flew the Guys of LIDAR & crew out to Arizona, let us use his RV as a command post, and even cooked us lunch. It should say a lot about the integrity of a dealer who supports honest, unbiased testing, which is what Guys of LIDAR are all about. Also, big thanks go out to all GOL members & crew, everyone who loaned us equipment, people who donated to the cause, and everyone else who helped to make this event a big success! Enough formalities... on to the tests! Keepin' it real, one shot at a time. Why? Because we can! !